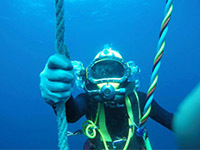 The 30 metre Scuba qualification is the starting point of the commercial diver’s training. This scuba qualification is used by the Police Force; Fire Department; various rescue teams; Marine Archaeologists; certain Aqua Culture divers; Media Divers; and Scientific Divers. Scuba is the start of basic training for the Professional Diver using surface supply. This qualification limits the diver to Scuba diving using small hand tools and conducting simple inspections where no decompression is required with direct access to the water surface. 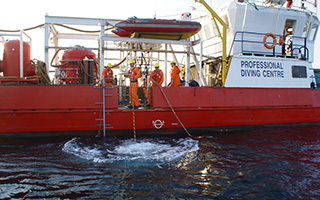 The diver may not operate large surface controlled power tools, or dive where the use of cranes, air lifts, diver dredging or winches are required. Cost: Please contact us as it varies with special offers at times.